To sum it up, A Walk In The Woods is a movie about my favorite thing: The Appalachian Trail. Like many others who care about the trail, I was excited when I first heard that a major motion picture was being done about the AT! A movie about a thru hike? What’s not to love?! However, with the release of the new movie, our favorite trail is about to get a whole lot of publicity, and with this extra attention, experts are predicting a record number of thru-hikers to be starting in the spring. This will potentially cause over crowding and overuse damage to the trail. Although many of these hikers are expected to drop out either in Georgia or not too far after, the results of overuse on these sections of the trail could be detrimental. As a 2016 female thru-hiker, I am personality less than excited for this wave of attention to come to the AT. To be honest, I am already used to all but being laughed at when I tell other outdoor enthusiasts about my plans to thru-hike, and I feel like with the rush of wanna be thru-hikers expected to come from the result of this movie, it will only get worse. After all, how are other people supposed to know that I have been training and preparing for this hike for over a year? Or that I decided to plan my hike after much research, not after seeing some movie. The thing that I find interesting however is that this movie actually made me never want to hike again. If I was just your average Joe watching this movie, I would be less than inspired. I don’t think they really sold the trail, if anything I think they made the whole experience seem crowded and dull. However, the theaters are filling up and thru-hike mania has already begun. Now, please don’t get me wrong; I thought the movie was very well done. It brought light to a trail that unfortunately many people have never even heard, and in the end, maybe people will think thru-hikers are a little less crazy after all. 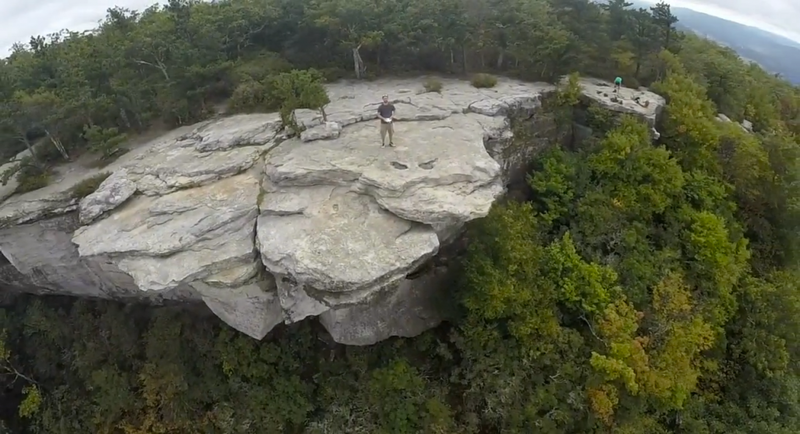 The cinematography was phenomenal, especially the scene shot at McAfee Knob. You very often see the typical picture taken at this lookout point with people standing very close to the edge, but A Walk In The Woods offered a very unique view of the mountain by using ariel views to allow the audience to see the area from 360 degrees. 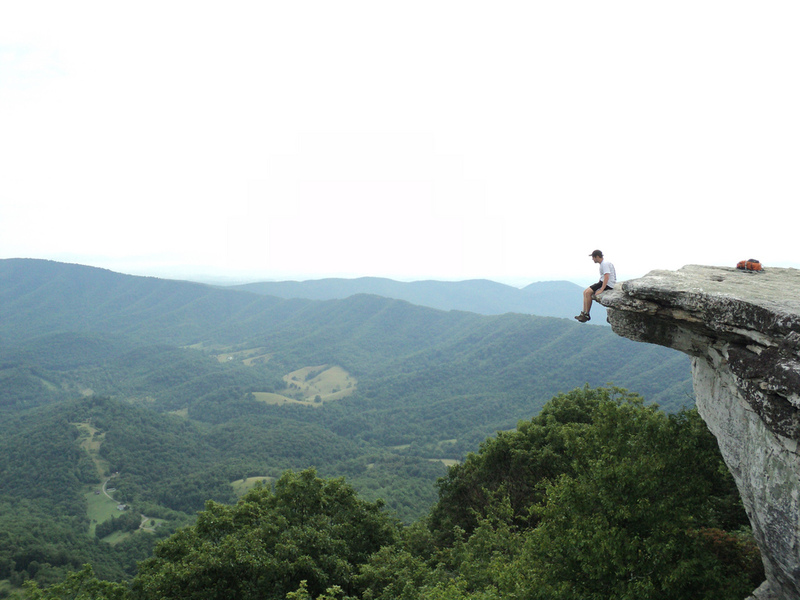 McAfee Knob view showed in the film. Aside from this, the movie was shot in a very creative way. Rich colors, and angles made for a very visually appealing film. Okay. I just went all art major on you. Sorry. I know that the point of the movie was not to explain the trail to people, but I feel as if they are cheapening the extreme test of mental and physical strength needed to complete the trail. Again in looking at this as an average person who knows almost nothing about hiking, I would get the impression that it truly is just a simple stroll in the woods. There are motels and restaurants for you to check in to the second you feel the slightest bit tired, and cold beer paired with a warm meal is just as accessible as a tree on the trail. To be honest, I think I was destined to dislike the movie before even seeing it. I simply know too much about A) backpacking, and B) the expected impacts on the trail to overlook minor discrepancies included in a Hollywood version of any hiking film (just so everyone knows, there are no Grizzly bears in the Appalachian Mountains). All in all, the movie is a funny take on a story we all know, and if it weren’t for all of the other things that surround the film, I myself may even admit to it not being so bad. Go see the movie yourself and let me know your thoughts! I had a similar reaction too, is this really going to make MORE people want to hike the trail? I mean… it wasn’t exactly an advertisement considering the main characters seemed to hate the trail and everyone on it. Of course I didn’t see the end so maybe that get’s people? IDK! PS hope we see you out there! I’m actually pushing my half-thru attempt out until ’17 or ’18. The boards are blowing up all over the Internet. I have no desire to hike among a throng. I’m now planning on flip-flopping, starting in Harpers Ferry in 2016, instead of Springer. Actually getting more excited about this alternative itinerary. Love the idea of being in NH and Maine in July. I walked out of the movie because I’m under the age of 65. It did more to discourage my 2016 thru-hike than anxious or excited. The only influx to expect would be boomer-age and older people attempting a thru-hike. I support recreation and hiking for all ages and physical conditions, but I think the movie would give the opposite of inspiration to anyone under 65 who would actually see the movie. It did not glamorize the trail at all and made the trail look dangerous, rugged, expensive, and boring as a cherry on top. I’m 24 and I don’t know anyone within 15 years of my age who would see a Robert Redford or Nick Nolte film. God, I’m really questioning my choices for seeing the movie. Appalachian Trials is actually inspiring and costs a lot less than a movie ticket. I agree that the influx may not be as everyone seems to think. I went to see it with my parents (perhaps not so surprisingly, none of my young friends wanted to see it) and even they did not find the movie too interesting. My stepdad, bless his heart, said it sounded like something he would have liked to do when he was younger but maybe he could do a couple days now. I think we might get an increase in parental encouragement on the trail but probably not much hikers.